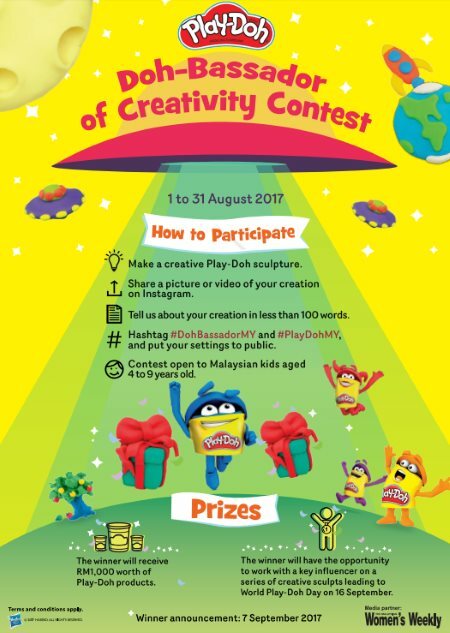 Home » creative » Free » instagram » photo » slogan » Play-Doh's Doh-Bassador of Creativity Contest: Win RM1,000 worth of Play-Doh products! Play-Doh's Doh-Bassador of Creativity Contest: Win RM1,000 worth of Play-Doh products! The search is on for Malaysia’s most creative child as Play-Doh kick starts its inaugural ‘Doh-Bassador of Creativity’ from 1st – 31st August 2017. Organised by Hasbro Toy (Malaysia) Sdn Bhd, the contest invites children aged 4 to 9 years old from around Malaysia to ‘Open A Can of Imagination” to produce their most original and creative sculpture using Play-Doh compound. *The winner will have the opportunity to work with a key influencer on a series of creative sculpts leading to World Play-Doh Day on 16 September. Visit Play-Doh's Doh-Bassador of Creativity Contest info for more details.